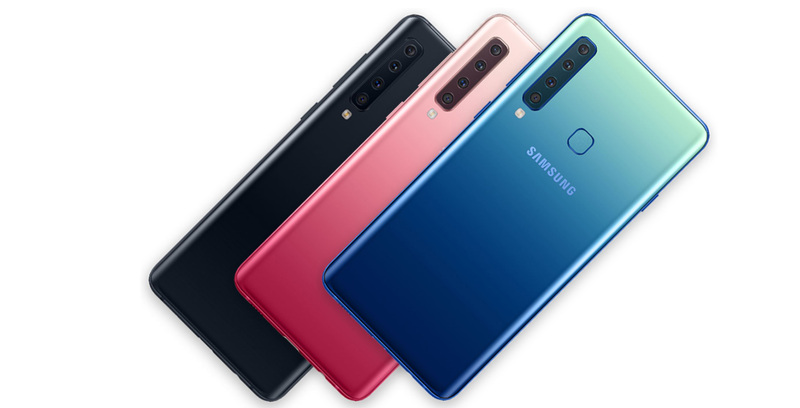 Samsung has unveiled the phone with 4x the fun, the Samsung Galaxy A9 (2o18). The smartphone features four cameras on its rear, as leaked yesterday, and one selfie shooter. The handset also sports a 6.3-inch Super AMOLED display with a 1,080 x 2,220-pixel resolution, Qualcomm’s Snapdragon 710 processor, up to 8GB of RAM a 3,800mAh battery, a 3.5mm headphone jack, USB Type-C port, 128GB of expandable storage and Android 8.0 Oreo. As leaked by Evan Blass yesterday, the device uses an 8-megapixel ultra-wide camera with a f/2.4 aperture and a 120-degree field of view, a 10-megapixel telephoto camera with a f/2.4 aperture and 2x optical zoom, a 24-megapixel camera with a f/1.7 aperture and a 5-megapixel depth camera with a f/2.2 aperture. Meanwhile, on the front, the phone features a 24-megapixel selfie shooter with a f/2.o aperture. The phone comes in ‘Lemonade Blue’, ‘Caviar Black’, and ‘Bubblegum Pink’. Samsung is selling the device for €599 ($903 CAD) in the European market. We’ve reached out to Samsung to see if the A9 is coming to Canada, but it’s quite unlikely.